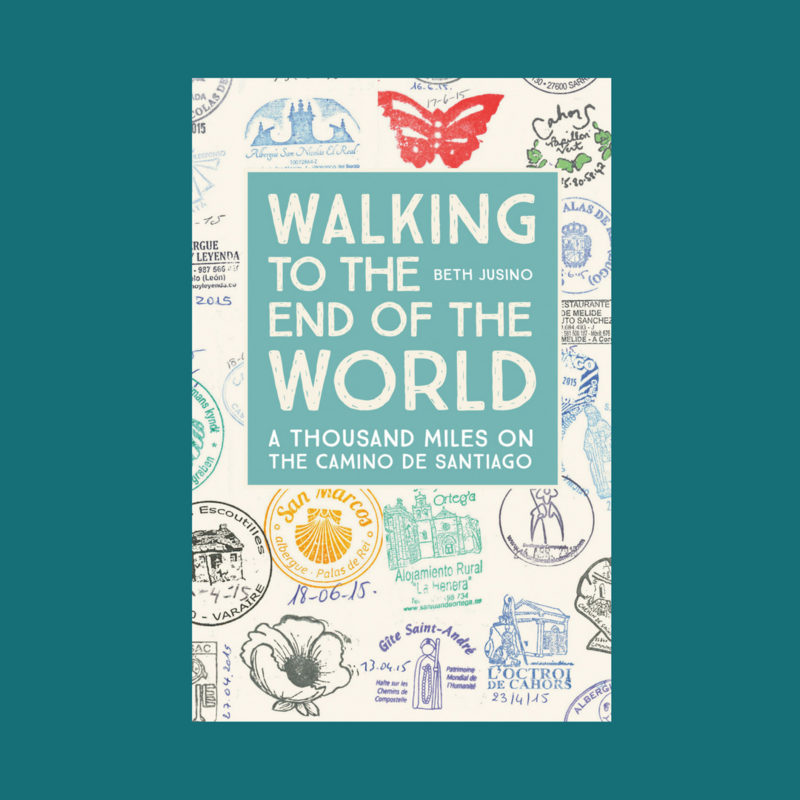 One of the great things about the Camino de Santiago is that you can walk as far as you want to in a day. With plenty of towns and hostels along the various ways, there aren’t limiting “stages” that you must follow. If you want to walk 5 kilometers or 45, you can. A result of that, though, is that people who you meet on the Camino may never end up in the same place as you. Walking just one town farther sets you up on a different path, and there’s no real shared experience until Santiago. But there’s an exception on the Camino del Norte. Everyone, or at least almost everyone, stops at the Cabaña del Abuelo Peuto in the tiny Cantabrian town of Güemes. Güemes is listed as a “recommended” stop in every guidebook I saw, in every language. 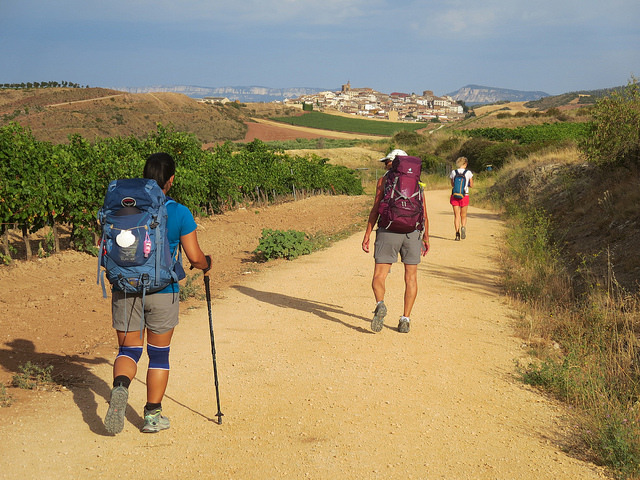 The tiny hamlet, population 277, hosted 11,000 Camino pilgrims from 80 countries last year. The bloggers I trust all listed is as a favorite stop. As Eric and I drew close to the famous place on our 12th day of walking, our curiosity grew. About a kilometer before we arrived, we caught up with Sania, a British pilgrim we’d met before, and we all speculated together. Was it a cult? A religious thing? Was the mysterious “Padre Ernesto” going to try to convert us to something? The walk that day from Noja was just sixteen kilometers, with no towns or bars along the way, so it was still late morning when we drew close. It seemed too early to show up at an albergue, so we stopped for a picnic snack about a kilometer from the albergue, in the yard of what appeared to be a church. When we looked closer, though, we found something more like a community museum dedicated to Padre Ernesto and the volunteer-run albergue. The walls were crowded with art contributed from previous pilgrims, and piles of guestbooks lined the tables, full of glowing reports. Signs in various languages explained the story. I wasn’t sure what to make of it. Could any albergue be this good? “Don’t drink the Kool-Aid,” we warned each other, only half joking, as we approached the big white farmhouse on the hill. And then we were swept up into the most efficient, caring, understanding, intuitively perfect albergue I’ve ever seen. Volunteers met us at the door and helped us take off our backpacks. They brought us cool water and the best cookies I’ve ever eaten. Inside, we found Peter, Michele, and Olivier, who I’d taken to calling the “French boys.” We’d lost track of them two days before, when they went ahead and we stayed to explore Castro Urdiales, but now here they were, just finishing a full lunch provided by the volunteers. Everyone stops in Güemes. Gradually, the volunteers helped us check in and showed us to an airy room with ten beds carved into the walls. The third-tier bunk seemed a bit precarious when we tested it, but our room had only nine people, so no one had to actually sleep there. Outside, I started to understand the appeal of Güemes. Behind the original farmhouse, which I understood was the mysterious Padre Ernesto’s family home, was a Camino oasis. A wide, manicured green lawn stretched the length of the property, inviting stretching and naps in the sun. Custom-built albergue rooms and converted sheds and garages were all filled with beds. This place was equipped to house hundreds of people, but it never felt big or impersonal. There were benches everywhere, and plenty of laundry lines. A library, a nonsectarian chapel, and a lounge offered quiet, indoor refuge if the weather turned against us. It all looked like it was built bit by bit over many years, with care and carpentry skill but without much of a master plan. The only downside, at least in the minds of our French boys, was that there was nowhere to get a post-hike beer. But there were plenty of cookies, which were enough for me. At 7:30, pilgrims streamed from every corner of the complex into the lounge. There, with the help of Sania as an English translator and Michele in French, a volunteer explained the story of Padre Ernesto and Cabaña del Abuelo Peuto. The short version was that Ernesto, who had not yet made an appearance, was a Catholic priest who had served in remote corners of the world, but returned home to Güemes where he was born. He inherited his family home and opened it to pilgrims – just a handful at first, but then growing. The enterprise is now run entirely by volunteers, on donations that also support other community projects. While we were not charged for anything during our stay, we were encouraged to donate what we felt was fair. It was funny and interesting and very well-rehearsed. This is what they do every night, and they do it well. They also do dinner well. Our group of pilgrims was led from the lounge to the dining room, where volunteers filled us with soup and pasta and salad and wine. Plates were never empty long. During the meal, Padre Ernesto finally arrived. The octogenarian had a full head of white hair and a quiet voice. He passed from table to table, greeting people in Spanish and inviting us to the chapel, where a series of murals on the walls would explain the philosophy of the place. I had no intention of going. I was tired, and inspirational lectures aren’t usually my thing. I slipped out, intending to read in bed until I fell asleep at 9:00, like normal. But the Camino had other ideas. On my way to the bathroom to brush my teeth, I ran into Padre Ernesto, on his way to the chapel. He stopped to say hello, and in my fractured Spanish I thanked him for the hospitality. He asked where I was from, and when I said Seattle, he lit up. Padre Ernesto of Güemes, Spain, population 277, had been a few miles from my home in Seattle just a month before. He had been making a tour of the Guemes of the world (there are three), including Guemes Island in the Puget Sound. He held my hand as he said this, and asked if I was coming to hear the talk about the murals. It was very important to him that I be there. He wanted me to hear what he had to say. There’s no way to say no to that, so I went to the round room lined with benches and listened to the well-spoken volunteer explain the paintings while Sania translated, and then Padre Ernesto told everyone there about how I was from Washington state. He patted my head as he explained how important it was that I was here, bringing his journey full circle. And then, in the way octogenarians can, he spun off into a series of anecdotes about other pilgrims and other times. I’m still not sure what he thought it was important for me to hear. By the time we were done, the sun was down and the compound was dark. The next morning at breakfast (because of course the volunteers of Güemes also provide an incredible breakfast, with more cookies), Padre Ernesto sought me out again, asking for a photo together to add to his collection, saying again how important it was that two peregrinos from Seattle came so far to his Güemes, after he had just been to ours. When we finally broke away and set out for Santander, there was no doubt. Güemes would be on my “top places to stay” list, as well. Maybe there was something in the cookies. Ha! I’m sure you did. They were very good at finding the fluent speakers on arrival.